In 1841, Charles Lyell, a British scientist and one of the fathers of modern geology ventured to Niagara Falls. From observations of the various rocks both at the Falls and along the Niagara River, Lyell was able to illustrate that the cascading waters had eroded the gorge from the edge of the escarpment at Queenston – Lewiston to its present location. Lyell’s conclusions were supported by an equally distinguished American geologist, James Hall. His independent studies for the State of New York included the first accurate survey of the rim of the falls to establish a basis for measuring the rate of recession. Niagara Falls has eroded 11.4 kilometers (7.1 miles) during the last 12,300 years. The limestone cap rock, which the water is currently flowing over, is more resistant to erosion. This limestone layer began approximately 0.5 kilometer north of the Rainbow Bridge. As the Falls continue to erode southward, the erosion rate will increase when it reaches Navy Island when the Falls will reach a softer layer of rock. The development of hydro electric generating plants through water diversion along the shoreline of the Niagara River has vastly reduced the rate of water flow. In 1938, the deepest flow of water, which is located at the crest of the Horseshoe Falls, was recorded at 7.6 meters (25 feet). Hydro diversion has reduced the water flow rate. 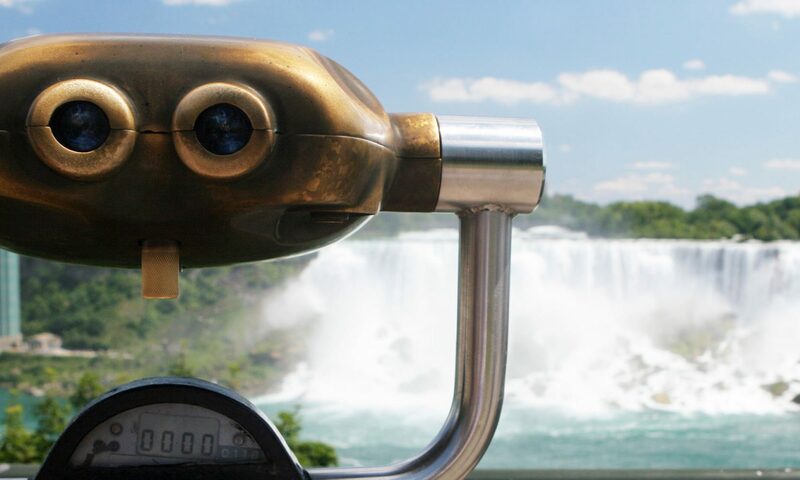 800 – 600 years ago the Niagara Falls existed as a single water fall. The separation of the water fall into the two water falls: the American & Horseshoe Falls is relatively new in its 12,000 year history. Recession of the waterfall brought the cascading water to the brink of the bedrock sill known as the Lyell / Johnson Ridge at Hubbard Point. At the Lyell/ Johnson Ridge the cap rock reaches it maximum height above sea level. From this point the height of the Falls diminishes to the site of the current location of the Falls. The crest line of water falls was relatively straight until 1775 when the Horseshoe shape began to form. Two thousand years ago, the crest line of the Falls was located north of the current Rainbow Bridge. Four thousand five hundred years ago, the crest line of the Falls was located north of the current Whirlpool Bridge. The shape of the crest line determines its stability. The uniform Horseshoe shape of the crest line of the Falls provides greater stability. The deepest plunge pools are carved out when the crest line of the Falls is relatively stable. The American Falls has no regular mode of collapse. The present amount of water flowing over the American Falls is insufficient to erode the Irondequoit Dolostone (limestone) rock debris at the base of the Falls. The rock surface reaches its maximum at Hubbard Point (along Canadian side of gorge). A complex system of joints in the Lockport Limestone cap rock was uncovered. The joints were more numerous near the crest and reached vertically to shale level below increasing likelihood of undermining. Ground water seepage into the numerous joints increased the hydrostatic pressure as did winter freezing forcing segments of the limestone to be forced further a part creating the possibility of further fracturing of this cap rock layer. Falling and flowing water carry broken or weakened pieces of rock away. Some of the mineral deposits of the Lockport Limestone are washed away when water flushes through the fissures in the rock. These minerals which are normally used to maintain the strength and resilience when absent speed the fracturing process. Wetting and drying of Rochester Shale – tests show that after approximately ten (10) such cycles, the Rochester shale will deteriorate naturally undermining the Lockport Limestone cap rock. Freezing and thawing repeatedly forcing rock to separate and break away. Rock falls that occur expose more weakened and vulnerable rock layers. Instruments were installed on Prospect Point, Luna Island and Terrapin Point to monitor any future rock movements. Rock bolts, which are steel dowels and cable tendons were inserted in a pattern at Luna Island and the Bridal Veil Falls to solidify and stabilize the rocks as much as possible. Drainage holes were drilled into the Limestone at the American Falls, the Bridal Veil Falls and Terrapin Point to relieve the hydrostatic pressure. The rock talus at the base of the American Falls was left to the forces of nature. It was decided that to remove the talus would be too expensive and create too much of an artificial look. The water flowing over the American Falls is too little to erode the talus so it will be there until the American Falls remains as it is. Stress measurements taken near the crest of the American Falls measured 870 pounds per square inch parallel to the Niagara Gorge. Tensional forces measured near the crest of the American Falls equaled 300 pounds per square inch acting perpendicular to the gorge. A core sample taken from the bed of the American Falls reached the level of Queenston Shale at the depth of 359.2 feet. The mean rate of erosion was 3.5 meters (5 feet) per year. Since 1942 the rate has been much slower. Today, through increased water diversion and anti-erosion remedial steps, the rate of recession at the Horseshoe Falls has been reduced to a fraction of what it used to be. Today it is estimated that erosion of the Horseshoe Falls is less than one foot per year. In the future, through remedial efforts and further water diversion that the amount of erosion at the Horseshoe Falls has been projected to be reduced to approximately 1 foot every 10 years. Today, erosion of the American Falls is estimated at 3 – 4 inches every 10 years. The water flow which is regulated at a minimum level of 10% of the estimated 100,000 cubic feet per second during the summer (50,000 cubic feet per second during winter) is insufficient to cause major erosion.